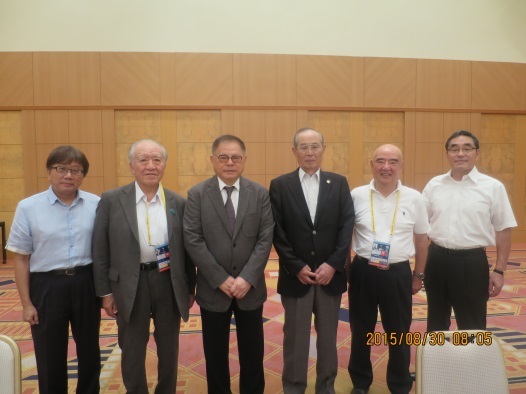 By taking the opportunity of 2015 U-18 Baseball World Championship in Osaka, Japan, President Tom Peng of Baseball Federation of Asia and newly elected President Norio Ichino of Baseball Federation of Japan got together in Osaka on August 30, 2015. Bearing in mind that the decision by the Tokyo Organizers which event(s) will be included in the Tokyo 2020 Olympic is around the corner, both leaders were encouraged that the U-18 Baseball World Championship which started on August 28, has already attracting huge interest in Japan particularly among the youth helped by wide media coverage. Both Presidents reaffirmed their desire to strengthen the close cooperative ties and support activities of the World Baseball Softball Confederation. They agreed to take up medium to long term promotion of Baseball in Asia and other important issues including schedule of the tournaments with the member Federations when they assemble for the BFA Congress in Taichung on September 21, immediate following the Asian Baseball Championship.